Just before Christmas a neighbour from the other end of the lake discovered my blog while searching for photos of Kingsford Lake to send to a friend. It’s nice to know other people on the lake, but we haven’t met too many of our neighbours yet. Unlike in subdivisions, where you might meet someone who’s out shovelling their driveway while you’re walking your dog (or etc), you don’t tend to have many opportunities to run into your neighbours in rural settings. Most of the folks we’ve met have been deliberate introductions – for instance, Dan returning a dog to house 8994 (the number on the dog tag) and meeting the owners (it turns out their dog is a regular wanderer), or our neighbour to the south noticing me with Raven down at our dock, and coming down from his place to say hello. We have met a couple others on the road, but we still don’t know a lot of the residents. So it was nice to meet someone who’s been in the area a while and knows the lake and its people. She sent me a note the other day to warn that the company who manages the dam at the north end of the lake, up near where their house is, had opened it up to allow some water to drain. She indicated that the water had been flowing through the dam at an impressive rate, which would cause the water level of the lake to drop abruptly and might make the ice unstable. We’ve heard some eerie groans and gurgles coming from the lake, often sounding remarkably like a bathtub draining, frequently at first though they’ve mostly subsided now. We’ve seen some of our other neighbours (whom we can identify from our house by their accompanying dogs) out skating or skiing on the lake the last few days, so this afternoon we decided to venture out with Raven for her daily walk. 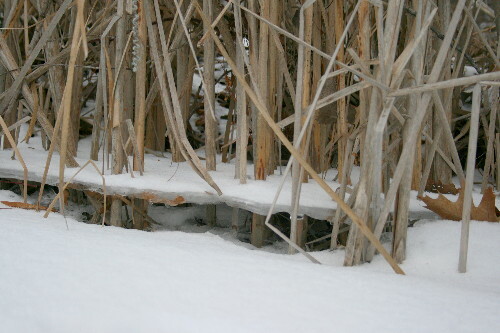 When the water first started draining out of the lake from under the layer of ice, there would have been an air pocket between the new water surface level and the frozen ice above, sometimes referred to as a suspended ice roof. If this is large and/or the ice is thin, it can be dangerous, as the ice no longer has the pressure of the water pressing back on it from underneath and lending support. Even thick ice, that’s normally considered safe, has the potential to crack when it’s not supported by water underneath, and if someone falls through a hole into the water, their head and arms can often be below the level of the ice and therefore out of sight from potential rescuers. Some of the bathtub sounds we heard was likely air being sucked in from the edges of the lake or islands where the ice was open, to fill the void that the emptying water was leaving. 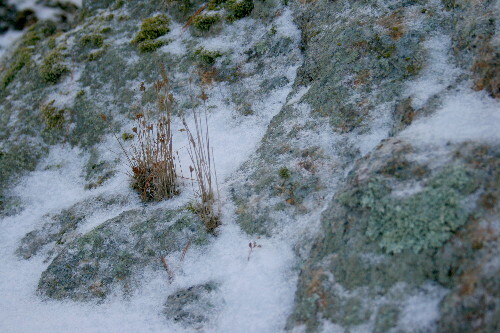 However, there is some evidence that the ice has settled as the water level dropped and now rests atop the water again. 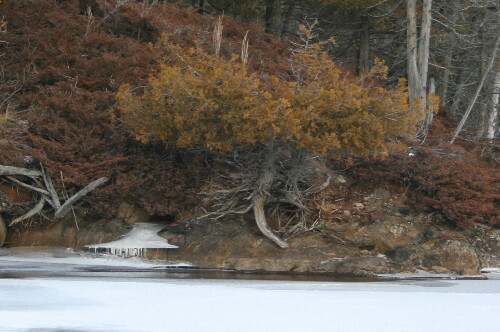 One of these signs is the ridges of ice affixed to the sides of rocks and tree trunks at the lake edges. 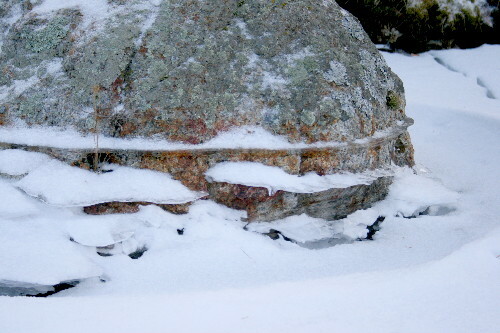 I was really fascinated by the ledges left behind by the sinking ice, where it had affixed to the earthbound surfaces. You don’t think of the ice as moving, and yet here was evidence that it had. I thought it was neat how you could see the progression of the sinking ice level. 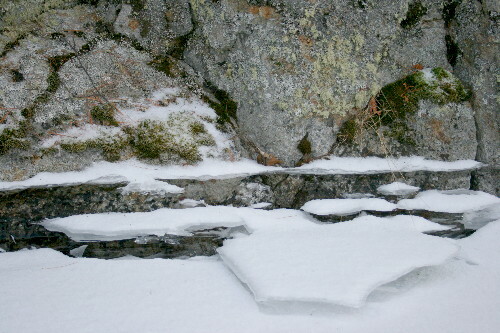 In some spots there where three or even four ice ledges, one above the other. If the gurgles were the air seeping in under the ice surface from the edges as the water level dropped, the groans must have been the ice itself settling back down to sit on the water. The other apparent sign that the ice has settled down onto the water again was this. We found about eight of these holes. About 8 inches (20 cm) in diameter, and spaced regularly in a line across the open part of the lake, these were obviously someone’s ice fishing holes. 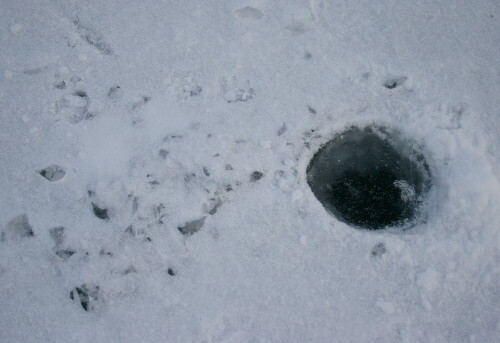 The ice level in the hole was about an inch below the surface of the surrounding ice, and while most of the lake ice was cloudy white, the ice in the hole was a clear black. If you cleared the snow off its surface you could see the milky white of the thick lake ice forming the sides of the hole. The fact that the hole was frozen over implies that the ice was resting on the water surface, since if it had been drilled while there was air under the ice it wouldn’t have frozen closed again (there being no water in the hole to freeze). I suppose it’s entirely possible that these were made before the water level dropped; although they looked relatively fresh, it’s really rather hard to tell for certain. There was a layer of crusty snow over the pile of ice shards, which we got last night, so all I could really tell was that they weren’t drilled today. The most definitive way to tell where the ice sits relative to the water, of course, would be to drill a small hole and check it directly. Our neighbour to the south has been checking the ice; when we saw him the other day he said that it was 6 inches thick, but gave no indication of whether there was an air pocket underneath. We don’t have an ice auger or a drill bit long enough to make even a little hole that we could poke a straw or stick through, so we have to rely on the information of others. As long as we haven’t had a warm spell to soften the ice, we’ve still been going out, but we stick to the shallows and go out in pairs and try to be careful while we’re out there. Neat pictures of the ice. 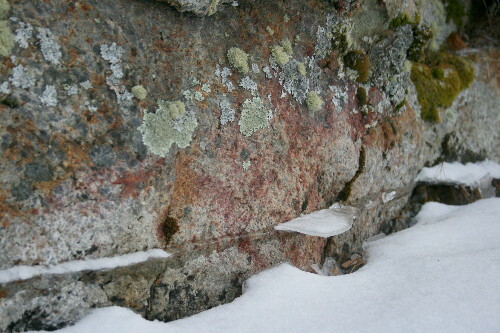 I also loved the contrast between the white snow and ice and the lichen on the rocks. Stay safe out there. I lived in the high Sierra mountains where we get much more snow but not the kind of cold that you do. Ice on lakes seems very unstable to me. Shudder! I can only remember one winter where we could skate on the ponds . . . Fascinating albeit scary. It’s only in the last two years that I’ve lived in climate where water freezes solid enough to walk upon. It’s incredibly difficult to imagine being comfortable doing so, even without air pockets. That is so cool! I’m going to watch for signs of fluctuating water levels now. I don’t tend to think of ponds as going anywhere once they freeze over, but your photos sure show that they do. It’s funny how growing up with ice makes you really take it for granted, Liza Lee and Wren. It’s easy to become totally blase about it out here, where lakes and ponds usually freeze solid enough to support snowmobiles by midwinter (up north where it’s even colder the only time of year when they can drive cars to some settlements is in the winter because lakes freeze solid enough to support vehicles). That’s not to say that it’s always safe, but one tends to feel more comfortable about it. Kind of like how you wonder how any sane Australian could possibly be casual about living among so many deadly creatures. It wasn’t something that really occurred to me, either, Lavenderbay, until I saw the evidence out on our lake.